Download the Arduino IO Package from here. You need to Sign up before download. Then open the MATLAB software, go through the Arduino IO folder, open the install_arduino.m file and Run it in Matlab. You will see a message of “Arduino folders added to the path” in command window of MATLAB, means MATLAB path is updated to Arduino folders. That’s how we make the Arduino, communicate with MATLAB. Above method is suitable for “MATLAB R2013b or earlier versions”, if you are using the higher version of MATLAB (like R2015b or R2016a), you can directly click on Add-ons Tab in MATLAB and then click “Get Hardware Support Packages”, from where you can install Arduino packages for MATLAB. After installing files, now you can create a GUI for Home Automation Project. Basically in GUI, we are creating Push Buttons for controlling the home appliances from computer. Buttons can be created by going into “Graphical User Interface” in “New” menu in MATLAB. Further we can set the name and colours of these buttons, we have created 8 buttons, in which six to ON and OFF three home appliances and two buttons to ON and OFF all the appliances simultaneously. Now after creating the buttons, when you click on Run button in that GUI window, it will ask you to save this GUI file (with extension .fig), also known as ‘fig file’. As soon you saved the file, it will automatically create a code file (with extension .m), also known as ‘M file’ (see below screen shot), where you can put the Code (given in Code section below). You can download the GUI file and Code file for this project from here: Home_Automation_system.fig and Home_Automation_system.m (right click and select Save link as…), or you can create them yourself like we have explained. READ Did You Ever Want to Have a Video Doorphone? 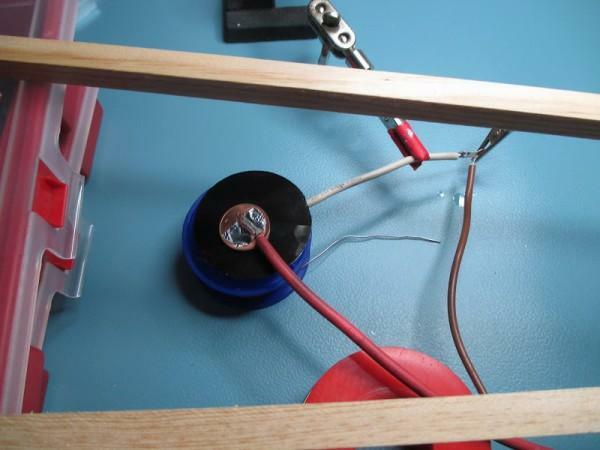 In this project, there is no Arduino code except the Arduino MATLAB support package code or file. As explained earlier that code file (.m file) is automatically generated while saving the GUI file (.fig file). There is already some code prewritten in .m file. Basically these are Callback functions for Push buttons, means we can define what should happen on clicking on these Push Buttons. In MATLAB code, first we initialise serial port and make it an object by using a variable. 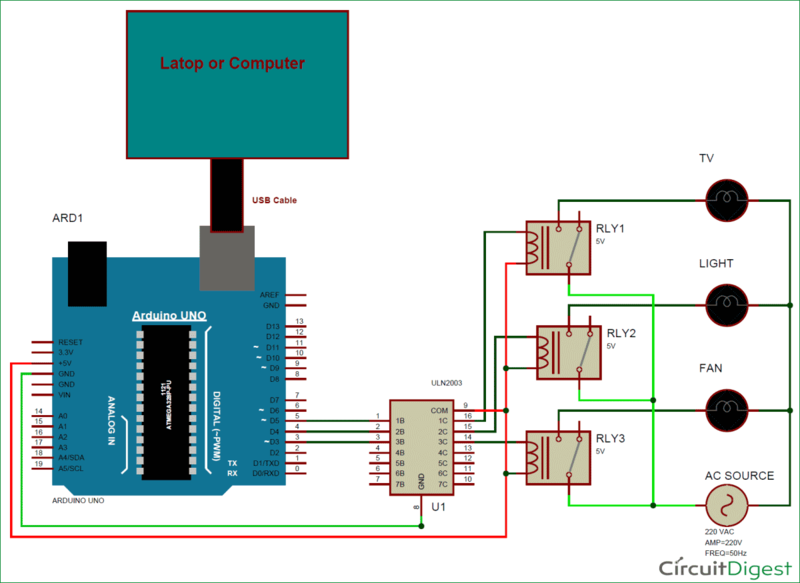 And then we can start programming like Arduino using the variable. 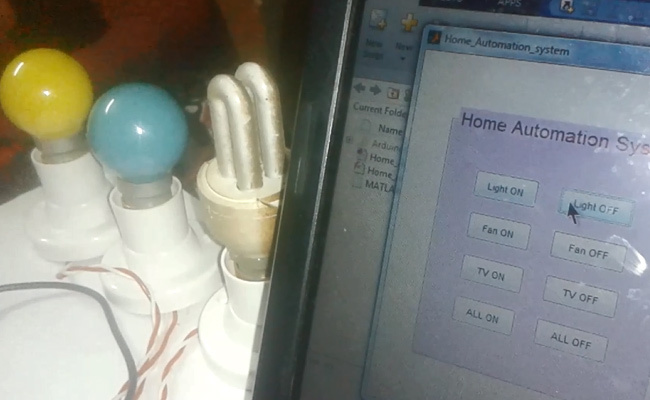 Likewise we can write the code in the Callback functions of all the buttons, to control the other connected Home Appliances, check the full MATLAB Code below (.m file).